As he tells it, Dr. David Feinberg’s ascension to the C-suite was a bit of a happy accident. Now the CEO of Geisinger Health System in Pennsylvania, Feinberg’s first executive post was as interim-CEO of UCLA Health in 2008. As the title suggests, it was only supposed to be temporary until a long-term replacement could be found, according to Feinberg. Feinberg ended up serving as CEO of UCLA for eight years, ultimately rising to president and CEO in 2011. How did he do it? By focusing on one strategic goal: creating a world-class patient experience. “I had a mentor who told me, ‘If you try to focus on 1,000 things, you won’t make an impact on any of them. Find one thing and make it your legacy.’ For me that was focusing on the patient,” said Feinberg, who took the top job at Geisinger in 2015. Feinberg shared this anecdote from his personal story, as well as other valuable insights and advice, during his visit to the Johns Hopkins Carey Business School on February 8. Feinberg spent the day conferring with students, faculty, and school leadership as part of Carey’s Executives in Residence (EIR) program. The EIR program invites C-suite executives from a variety of sectors and industries to campus for one day to meet with students, guest-lecture in classrooms, and visit with leading faculty in their fields. During his stay, Carey students studying health care met with Feinberg over lunch for an hour-long, wide-ranging discussion moderated by Associate Professor Mario Macis, an economist specializing in health care economics. Feinberg touched on several topics during the talk, including the value of a business education in the health care industry, how technology is disrupting medicine, and his mission to create a patient-first health care system. The discussion included a Q-and-A with the students. Feinberg, who has a MBA from Pepperdine University, credits his decision to seek business education, in part, to Carey. Prior to enrolling at Pepperdine, he earned a Certificate in Business of Medicine from Carey, which he said worked as a springboard to the degree. He said his MBA was essential to his rise to hospital CEO. 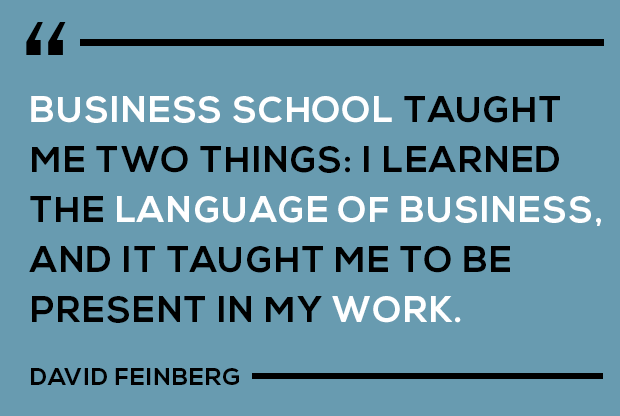 "Business school taught me two things: I learned the language of business, and it taught me to be present in my work," Feinberg said. Another topic of discussion was Feinberg’s commitment to creating a first-class patient experience. It’s an initiative he started at UCLA and continued at Geisinger. Under Feinberg, patient satisfaction at UCLA went from the 38th percentile to the 99th percentile. 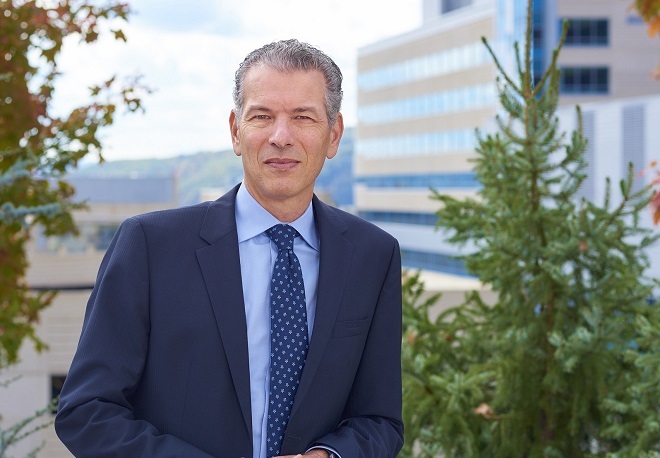 At Geisinger, he’s instituted a program called ProvenExperience; two calling cards of the program are refunds for dissatisfied customers and same-day appointments. Feinberg, who makes daily rounds at Geisinger facilities, said a key part of his success is a good communication strategy.